Quite frankly, such an outcome is only one of two that I would pinpoint as likely. Coming off of a Kentucky Derby that was littered immense talent, I must confess myself somewhat disappointed in the field that will take to the starting gate in Baltimore this Saturday. Gemologist is hurt. Dullahan and Union Rags will wait until the Belmont. And so we head into the Preakness with an eleven horse field. Below, I provide a sentence or two on each horse in the field, and a breakdown of how I expect the race to progress. 1 - TIGER WALK - 30/1: Closer who has yet to run will in a grade 1. With a lack of speed at the front, don't expect much. 2 - TEETH OF THE DOG - 15/1: He'll be fresh and fowardly positioned. Could be there, worth betting as a live long-shot, but not much more. 3 - PRETENSION - 30/1: Has yet to turn in a decent graded stakes run, but he'll be near the front, and with long odds he's worth playing as a long shot. Smart to bet it, but don't expect to cash that ticket. 4 - ZETTERHOLM - 20/1: Having never run in a stakes race, it's difficult to feel confident in this horse. Add to that his below average speed figures, and that task becomes harder yet. Still, he's turned in quality performances this year, look for him to make a play for the money. 5 - WENT THE DAY WELL - 6/1: With J R Velazquez aboard, you can't discount this colt, but I'm not expecting much. Went The Day Well came on strong at the end of the Derby, but the Derby featured exponentially more speed to run onto than this race will. Worth taking in exotics, but I don't have high hopes. 6 - CREATIVE CAUSE - 6/1: If you're looking for a closer, this is the one I'd look to before the 5. He'll be more forwardly placed and has more experience coming from mid pack in big races. Don't love closers, in this race, but if I had to take one, it'd be Creative Cause. 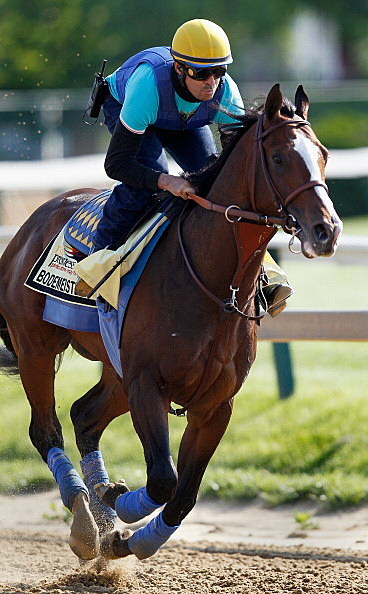 7 - BODEMEISTER - 8/5: The runner-up in the Derby, Bodemeister has been installed as the favorite and for good reason. He ran an unbelievable race in the Derby, but the distance and early speed proved too much. Here, the race is shorter, and he won't have to run nearly as hard to keep the lead wire to wire. In my opinion? Here's your winner. 8 - DADDY NOSE BEST - 12/1: The Asmussen trained colt is an interesting choice on Saturday. In the Derby, he was simply outclassed by much of the field. In a thinner, less quality-packed Preakness, Daddy Nose Best could be there. Still, he likes to come from the back of the pack, and I don't look to any of the closers as likely, here. Worth playing in exotics, though. 9 - I'LL HAVE ANOTHER - 5/2: The Kentucky Derby winner enters the Preakness as the second choice, though has it about as well as he could have in one of the biggest races of the year. He'll be able to sit comfortably near the front - which is his preference - and will likely be tasked with no more than running down he who he just ran down: Bodemeister. Clearly the second choice, though. 10 - OPTIMIZER - 30/1: Wouldn't be the right pick in a Thursday afternoon $20,000 claimer at Saratoga. 11 - COZZETTI - 30/1: If he falls below 50/1, bet him. If not. Stay the hell away. 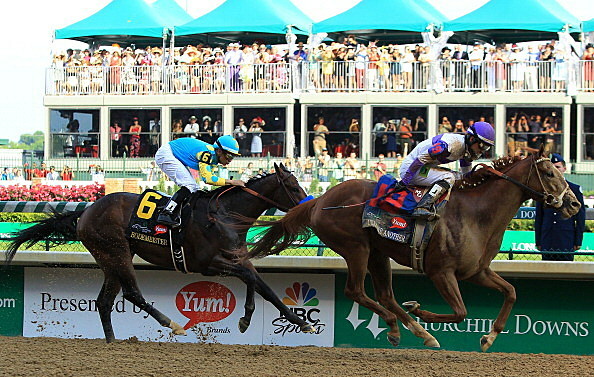 THE RACE: Out of the gate, expect Bodemeister to rocket to the lead. He does best from the front and I expect he'll be looking to run almost the same race he did in the Derby. I'll Have Another and Teeth Of The Dog will settle in behind him, with Pretension a length or two behind them, with the rest of field grouped together at the back into the final turn and down the backstretch. It'll be a reasonable pace; having learned from the Derby, and with no need to, Mike Smith won't push the colt too hard. Through the final turn, expect Bodemeister and I'll Have Another to begin to separate themselves, with Zetterholm, Daddy Nose Best, and Creative Cause revving up their runs on the outside. But as they hit the top of the stretch, and as Pretension and The Teeth Of the Dog slide back, I see the first and second place finishers in the Derby bolting away from the pack. They'll battle hard down the stretch, but ultimately, I see Bodemeister - who his connections have said has come out of the Derby better than he entered - clipping the wire first. I'll Have Another will take second, with Creative Cause third and either Zetterholm, Daddy Nose Best and Went the Day Well fourth. WHAT TO BET: Honestly, other than some long-shot across the boards I'm not sure there's a lot to bet. The obvious bet would be an exacta with I'll Have Another and Bodemeister, though such an exacta would likely cost more than it would pay. A trifecta with those two and Creative Cause is interesting, but again, the payout would be minimal. I love Zetterholm and Cozzetti as crazy long shots, and will likely play them when their odds fall enough. Though the Preakness doesn't look to feature the kind of quality the Derby did, it should be a great day from Maryland. If the race develops like I believe it will, we will be looking at a developing rivalry between two impressive three-year-olds. And though I expect Bodemeister to take the race, let's hope I'll Have Another runs down his foe again and brings us to Belmont with another battle between the two looming, and with Triple Crown on the line.